Pulmonary angiography is the most widely used technique to diagnose CPTE and to define the location and proximal extent of disease. Pulmonary angio-grams usually reveal intimal irregularities, webs, abrupt narrowing, poststeno-tic dilatation, and tortuous vessels . Residual mural thromboemboli that thicken the wall but do not deform the endovascular contour may be missed at catheter angiography. Computed tomography may show direct and indirect signs of CPTE. 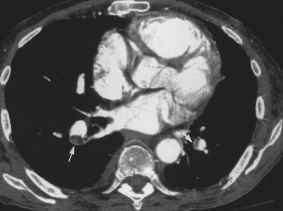 The direct CT findings are visualization of complete obstruction or adherent thrombotic clot (sometimes calcified) (Fig. 16). Adherent clot causes the vessel wall to appear eccentrically thickened (Fig. 17). There may also be evidence of recanalization within the intraluminal defect and arterial stenosis or webs (Fig. 18) . The indirect CT findings are mural irregularities in central and peripheral pulmonary branches, abrupt narrowing of the vessel diameter and abrupt cutoff of distal lobar or segmental artery branches . Computed tomography scans also depict changes of the systemic arterial circulation. In CPTE, the bronchial circulation is increased because peripheral bronchopul-monary anastomoses help maintain the pulmonary circulation. In one study, dilatation and tortuosity of bronchial arteries were seen in 77% of 39 patients with CPTE, and the authors suggested that the presence of visible bronchial arteries on CT is a significant criterion to suggest CPTE . Figure 16 Chronic PE. 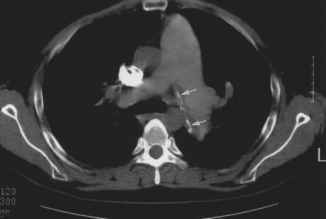 Suboptimal contrast-enhanced CT in 35-year-old man with chronic pulmonary thromboembolism. There is a mural thrombus with linear calcification (arrows) in the left main pulmonary artery. Figure 17 Chronic PE. 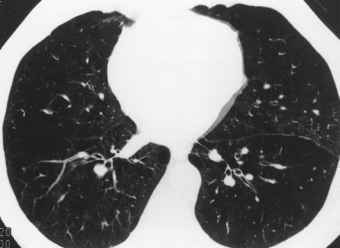 Computed tomography scan of 60-year-old man with chronic pulmonary thromboembolism. Mediastinal window through midzone reveals marginated mural thrombus in the inferior lobar pulmonary artery, bilaterally (arrows). tion of PAH: A main pulmonary artery diameter ^ 29 mm and an increased ratio between the diameter of segmental arteries and corresponding bronchi have high specificity (100%) for predicting the presence of PAH . Patients with CPTE develop right ventricular hypertrophy in response to significant elevation of pulmonary vascular resistance. Over time, right ventricular function deteriorates, even in the absence of recurrent PE, presumably because of the development of hypertensive vascular lesions in the nonobstructed pulmonary artery bed. The right heart dilates .